Thinking about the future and about habitations in the future, I always liked the idea of the bio-dome, so I sketched one up. 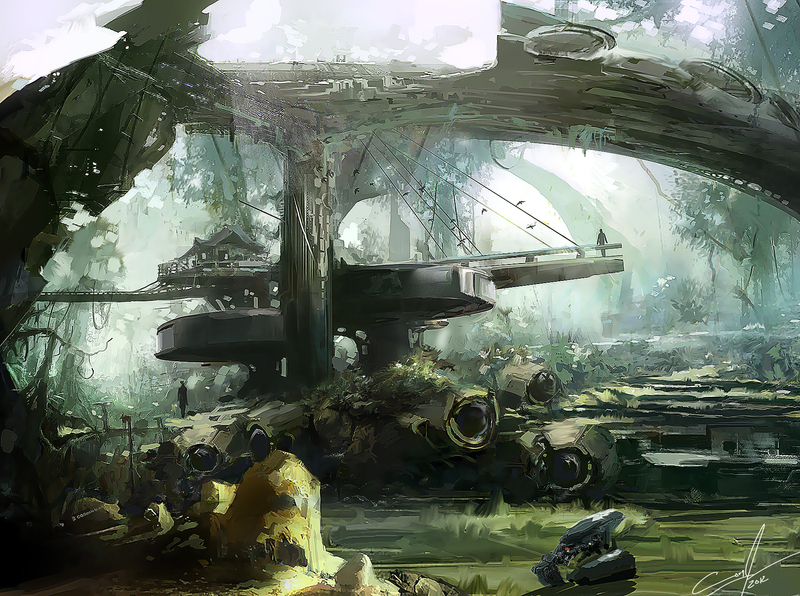 Imagine a dome-shaped Biosphere 2 that you could construct on a polluted earth, or even another planet. 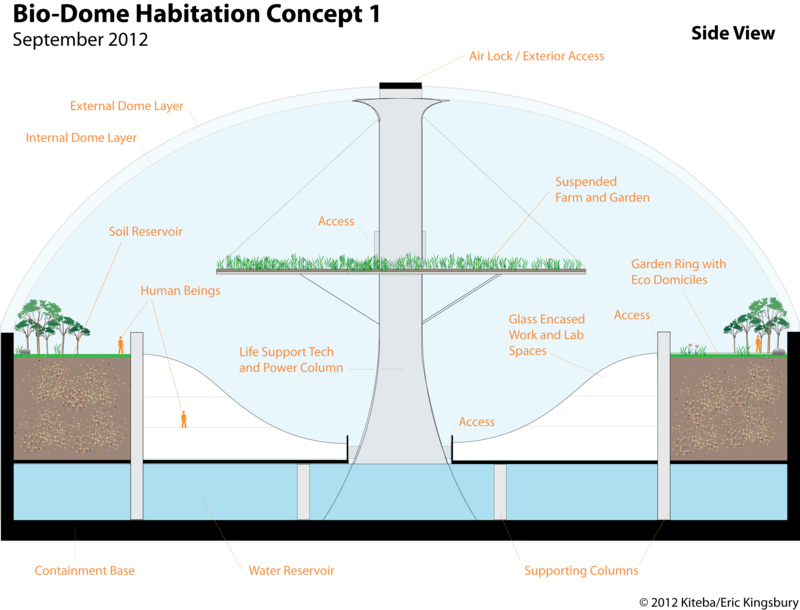 My concept here is a closed, domed, hothouse kind of system that could produce its own vegetation, conserve water and atmosphere, and support human life. This concept involves a dense, protective base, coupled with a two-ply sealed dome, supporting vegetation, farming, air, water and all kinds of life. There is a water reservoir at the base and soil in a circular ring, where oxygen-producing plants would grow and humans could live in a jungly paradise. The central column supports the dome and houses all the machinery that would keep the overall life support system working in equilibrium. There is even a suspended farming area. We don’t have any of the necessary engineering down here, but it’s pretty cool stuff, don’t you think? For some, the future is the place to which we defer our hopes. For others, the future is the place to which we defer our problems. I wonder if it has the carrying capacity for both. I’ve been reading Bill Franks’ Taming the Big Data Tidal Wave: Finding Opportunities in Huge Data Streams with Advanced Analytics. It’s a worthwhile read, though it’s written for novices in data science, so if you’re an expert in the space, you might find it dull. Generally, Franks provides a good overview of what the big data buzz is all about and outlines various opportunities to leverage this big data stuff. Anyway, flying home yesterday from Philadelphia, I was reading the chapter on web log data. There’s just a ton of it, but as Franks notes, a lot of it remains unleveraged. The easier-said-than-done secret in using big data to do interesting things is extracting, structuring, analyzing and then visualizing data in ways that provide meaningful insight. Insight that you can use to take future action. Web analytics, of course, is a fairly advanced discipline, and we can mine clickstream data to extract all kinds of useful information, such as web site performance, user shopping preferences, user segmentation and so on. But there are so many more possibilities, especially as we begin to link data on user behavior across the web (and not just on one web site). 1. An interesting unit of web data reporting might be the “Web Day.” If you could connect the data on every user on the web and slice it into unique Web Days, one per user per day, you would be able to capture the details of how people live their digital lives, individually, in segments and in the overall aggregate. 2. The data that you could bring together would be location data, time data, clickstream data and text entry data, among others. It would simply be a matter of stringing together a 24-hour narrative: “user_200431” got on at 6:00 am PST, visited these sites, clicked these links, watched this video, wrote a blog post here, did a specific keyword search on Google, commented on Facebook here, sent emails, logged off at this time, logged back on at this time, clicked here, bought this item from this site, etc. 3. The optics here could potentially be beautiful: imagine an interface where you could click on a single user ID, on a specific day, and see a visual timeline of activity, including site thumbnails, product thumbnails, text snippets, etc. You could drill down into a single activity or time period. 4. The analytics could also potentially correlate and synthesize data. You could query the database and build aggregate models of user segments and multi-day time periods. You could say to the database: give me every user who purchases kids toys online on Black Friday, then give me an aggregate common profile of their daily web activities for the prior week. In such a scenario, you could determine how people prepare to shop, what they are searching for, what influences their purchasing activity on that day, and then do something about it. 5. Privacy issues would have to be adequately handled, so there would have to be a way to mask a user’s personal identity. You could use a non-personally identifiable ID for each user. You’d also have to mask or withhold information that would be personally identifiable such as Facebook IDs and some posted content, etc. I think it could be done in a way that still retains all the really useful information. 6. I imagine such an analytics tool would be huge for brand marketers, sociologists, and people researchers of all kinds. There are many organizations who devote considerable energy to segmentation, trends and consumer insight. You could build this service and offer it to marketers on a software as service model. Sell licenses with monthly or annual fees. I think you’d want mobile and other non-web data in there too eventually, to make it even richer, and as it gets richer, the privacy issues become more acute. Of course, there are huge technical issues to tackle in terms of tying all the data together in a way that provides valuable output. But there’s a lot of smart people out there, and all problems that are worth solving can be solved. So that’s Web Day analytics. Cool idea? Creepy? What do you think? Warranties are interesting things. In the most familiar usage, they are commitments a corporation makes to consumers that its products will meet a predetermined performance level. If that performance level is not met, then the corporation will assume responsibility to repair, replace or refund. These kinds of warranties serve several business functions. They add to the overall value and quality perception of a product offering, and thus help build confidence in consumers at the point of purchase decision. The hope is that any quality doubt in the consumer’s mind can be overcome by the warranty; it may also be that a warranty can sway a consumer to buy one product over a competitive product that may not have a warranty. On the flip side, companies limit their liability through the warranty, agreeing to pay for this but not that. A warranty can also help a company hedge against poor product quality or limited value in the overall offer. A symbol of the limitation of liability that warranties imply are those little stickers you see on many products. You know the ones: “Warranty Void if Removed.” And what this always means is that if you open up the sealed system, any problems with the product are your responsibility. There’s also a boundary statement: beyond the seal is a territory reserved exclusively for authorized experts. Well, if you’re anything like me, you’ve peeled off plenty of those stickers on products, to fix things yourself or to simply learn what’s inside. It’s something I’ve had from childhood: you take things apart to see how they tick. What else are you supposed to do with things? How else can you soup up, hot-rod or customize? Who cares if you’re not an authorized service person? It’s your thing. You own it. And sometimes, you know, you put things back together the way they were, sometimes in a better configuration, or sometimes not at all. I think creating the future starts with taking off a hell of a lot of these “Warranty Void if Removed” stickers, in a metaphorical sense. Not just stickers on our laptops, but stickers on our lives, our work, our economy, our cities, our politics, our physical world, everything. When you open all these things up, of course, you void quite a few warranties. If you reconfigure how you work or live, for instance, you may have to give up whatever security or comfort that the big institutions of work (traditional corporate employment, perhaps) and life (government, “mainstream” society, whatever) guarantee you. But it’s your work. It’s your life. You own it. I first read about Neal Stephenson’s space tower concept on Google’s Solve for X earlier this year. If you haven’t read about it yet, Stephenson has proposed building a 20-kilometer space tower to facilitate the launch of space vehicles. Because the high-altitude tower avoids a lot of weather and gravity, it should reduce the expense and risk associated with space exploration. Here’s a recent write up from Kurzweil AI and one from New Scientist. I’ve been a fan of Stephenson’s work since Snow Crash in the ’90s, so it’s no surprise to me that he has visionary ideas, but what’s great about the space tower concept is that his ideas are connecting with people who can do the nitty-gritty engineering that would make the vision a reality. Specifically, Stephenson is working in collaboration with Keith Hjelmstad of the Fulton School of Engineering at Arizona State University (ASU) to make the tower feasible. Furthermore, this collaboration is part of ASU’s new Center of Science and the Imagination, an innovative initiative by ASU President Michael Crow to pair the visionary talents of artists and writers with the more practical talents of scientists and engineers in order to make big things happen. Cool, futuristic things. ASU’s Center of Science and the Imagination launches on September 27, 2012. As an ASU MBA alum and a veteran of post-MBA tech entrepreneurship studies at the Fulton school, I plan to be there for the launch event and will post how it goes. (Plus, my workplace (eBay’s FetchBack subsidiary) is literally across the street from campus, so it’s convenient!). Anyway, cheers to Stephenson and ASU: let’s keep putting artists and engineers together and make cool stuff happen. “Open thinking points beyond itself. Beyond all specialized and particular content, [open] thinking is actually and above all the force of resistance …” — Theodor W. Adorno, from “Resignation,” Collected in The Culture Industry. In our rapid, collective development of the future, as well as in our lived experience of the present, we have come to depend so much upon platforms. Especially in technology. But we use the term “platform” pretty broadly now, don’t we? I have heard people call all kinds of things a “platform.” Everything from an electronic device to a skill set to parenthood. Whether we mean a specific hardware-software architecture, or something more metaphorical, we must remember that platforms are there not only to make possible specific activities, but also to set meaningful limits on those activities. Like the chess platform — consisting of chessboard, chess pieces and the rule set itself — all platforms facilitate a rich set of activity, interaction and potential innovation. The chess platform makes the game possible in all its infinite combinations, on one hand, but it also constrains or limits what the game can be. A platform provides utility. And a platform limits possibilities. So platform thinking is playing within the rules of a game, and accepting the constraints inherent in that game. It’s incremental innovation space. Open thinking, by contrast, is playing a different game, outside the limitations of the platform, that “specialized and particular content” to which Adorno refers. It’s a resistance, the kind of rebellion that can and sometimes does shift the paradigm. It’s pure innovation space. It may mean supplanting the old platform with a new one. Or it may mean moving beyond platforms entirely. If you’ve been following the rapid development of 3D printing, you’re probably as amazed by the possibilities as I am. One of the things I love about it is that it’s a grassroots DIY movement open to the masses, so it takes manufacturing out of the normal scope and scale we’ve been used to for centuries. Another thing I love: not only can you design and print a real, customized and usable 3D object with a wide range of affordable 3D printers, but you can also upload, share and download designs on the web. I imagine a future where we won’t buy hard goods from stores; rather, we’ll download a CAD file of the thing we want and print it right at home. Make Magazine is a rich central resource for 3D printing and a variety of other “maker” activities. Check out the 3D printing workshops and other content on their 3D printing blog. At Shapeways, you can upload your own 3D design or use their online design tool. You can also sell your creation, or buy something from someone else. An important feature of the Shapeways service is that they do the printing for you, which may or may not turn you on. If nothing else, it’s a great way to try out 3D printing, without buying a printer. The prototype of tomorrow’s hard goods marketplace may have just arrived.